Jesse Moreno is the closest friend and a former classmate of Trent Lane. He plays rhythm guitar in Mystik Spiral. In his first appearance, he remembered Trent owed him a new shirt - after Trent vomited on the old one. That appears to have been Jesse's only shirt and he never got a new one (or forgot to), as he's always been seen shirtless. Jesse received almost no characterization during the series, mostly due to the lack of elaborate spoken lines. His most frequent uttered word (really a syllable) is a clueless-sounding "yeah!" Another facet of his personality is that he's interested in appealing to the ladies. 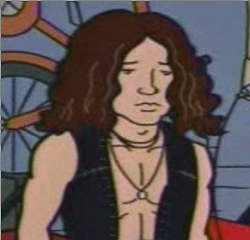 In the Mystik Spiral pilot episode (included on the Daria: The Complete Animated Series boxset), Jesse was shown to actually be a ladies man and capable of easily pulling chicks; it was not stated how he managed this. Though he is at one point described, by Jane Lane, as the "rhythm guitarist" for the band, he did take the solo for the Spiral's video Freaking Friends. He can also play a sitar, and defended its usage by saying the band needed to experiment more. The Daria Database says he has a younger brother named Danny, who's a "recording secretary" for the band's fan club. The laconic answers has prompted the theory that this character could be about as stupid as Tiffany Blum-Deckler. Trent: We'll be back later for our second set. Jesse: This was the first set! Fanfic has occasionally known to have Jane hooking up with Jesse, presumably to make a double-couple with Trent and Daria Morgendorffer. (See Gang of Four.) This attraction to Jane was hinted in Daria's story which parodied Jane Austen's "Sense and Sensibility" ("Write Where It Hurts") in which Jesse was described as Jane's suitor (which was also when he was given his surname "Moreno"). Jesse appears in very little fan comics but it is pretty hard to overlook him in the first page of Wouter Jaegers' Dariarotica story I trust you where he's attending a party at the Lane household. Jesse appears in the Alternate Universe fanfiction Blessings of the Moon along with the rest of Mystik Spiral where he and the rest of the band try to capture and contain the possessed Stacy Rowe. He ends up succumbing to the power of the moon, despite it's not a full moon, and becomes a werewolf. This page was last edited on 28 April 2018, at 18:08.